We've just returned from the Audi A8 world premiere here at Miami's star-studded Design Week, and we've got a slew of images of the new range-topping sedan. More evolutionary than revolutionary in style, the new wundersedan is nevertheless an impressive looking piece with the visual charisma to go toe-to-toe with the celebrities that filed in to fawn over its broad shoulders. Despite the clear heritage link to the outgoing model, there are a number of new technologies under the skin that represent firsts for the brand, including full LED headlamps that adjust their direction and throw based on the navigation system, a new development of MMI that includes a handwriting recognition feature, and an updated 4.2-liter FSI V8 engine with more power (372 horses) and an eight-speed Tiptronic gearbox. Despite being more powerful, the A8 is also more fuel efficient, with a claimed improvement of 15 percent with the aforementioned gas V8. The slippery new shell once again rests on the brand's Aluminum Space Frame (ASF), and Audi says the car is longer and wider than its competitors, yet it sits lower. The sleek new bodywork is good for a .26 coefficient of drag. When it comes to America late next year, the new A8 will arrive in both standard and extended-wheelbase models, and we have it on good authority that both TDI and hybrid variants will also come to the States - although the alternative fuel powertrains aren't likely to happen right away. While you're waiting, check out our high-res galleries below as well as the official press release. 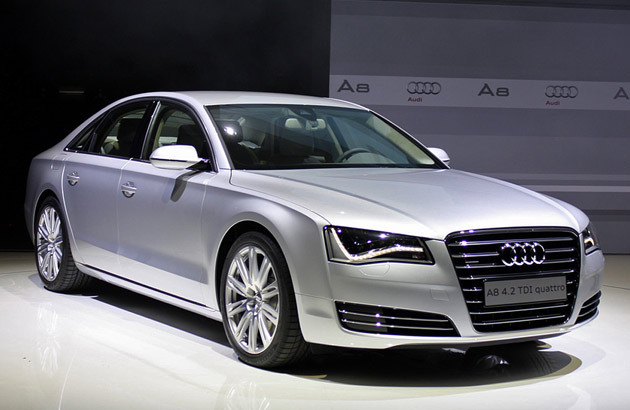 We're working on uploading video of the new A8 as well, so check back soon. Live photos copyright (C)2009 Chris Paukert / Weblogs, Inc.
2011 Audi A8 revealed amidst the stars at Design Miami 2009 originally appeared on Autoblog on Mon, 30 Nov 2009 21:34:00 EST. Please see our terms for use of feeds. Though we all owned skateboards in our younger years, we can admit that we were never really any good at riding them. That doesn't mean we didn't fantasize about all the great stunts we wished we could perform. And were there any among us who don't remember sitting in the back seat of a car watching the scenery go by at speed and thinking of all the sweet jumps and flips cars should be able to do? Filmmaker Jeff Richter undoubtedly has such memories, and Ford was kind enough to let him unleash those inner fantasies with a brand-spanking-new 2010 Mustang. 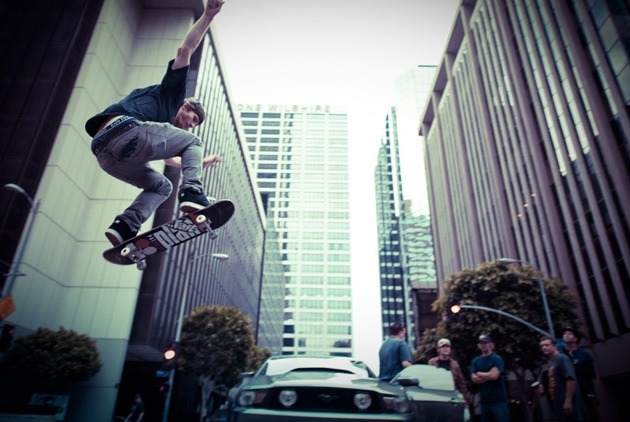 Also along for the ride are street skater Pat Duffy and X-Games gold medalist Jake Brown. A quick blip pops up at the start of the film letting the watcher know that some of the scenes are real and others are computer generated... we don't think you'll have too much trouble distinguishing one from the other. Hit the jump to watch the video. VIDEO: The Mustang skates in latest episode of Unleashed originally appeared on Autoblog on Mon, 30 Nov 2009 19:59:00 EST. Please see our terms for use of feeds. This ungainly little creature had an area all to itself at this year's Essen Motor Show. 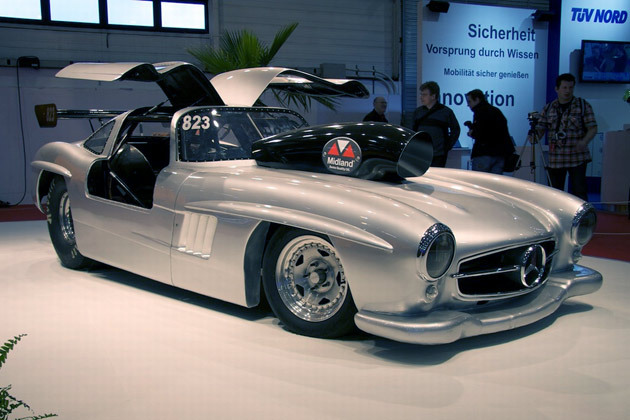 Built over four years by Swiss drag racer Stefan Winter - who is a roofer by trade - the most important thing to say is this: Winter did not mangle a genuine 1956 Mercedes 300 SL to create this beast, and we can thank all the gods that be for that. He copied the body in fiberglass and placed it over a tube chassis, hiding a small block Chevy in front that's been bored out to 422 cubic inches. Essen 2009: 1,050-hp 1956 Mercedes Gullwing drag car originally appeared on Autoblog on Mon, 30 Nov 2009 19:28:00 EST. Please see our terms for use of feeds. Daily U-Turn: What you missed on 11.30.09 originally appeared on Autoblog on Mon, 30 Nov 2009 19:20:00 EST. Please see our terms for use of feeds. While many confusing car-related things have happened in the upper strata of the Autoverse over the last few years (Aston Martin and Ferrari both being impart owned by Middle Eastern concerns, Aston Martin not being bankrupt) perhaps the most shocking and disconcerting was Ford's sale of Jaguar and Land Rover to India's Tata. To many, the scheme seemed doomed from the get go and after a couple cash-hemorrhaging quarters coupled to the recent recession, the naysayers appeared right. Turns out, Tata can say nay to the naysayers as its two prestige/luxury brands just turned a profit. A combination of cost cuts and attractive new models (LR4, XF) have helped catapult the long time money losers into the black. And while the $4.7 million in consolidated net profits last quarter is certainly nothing to jump for joy over, that nearly five million bucks is a nice change of pace from the usual Jag/Landy blood red ink. 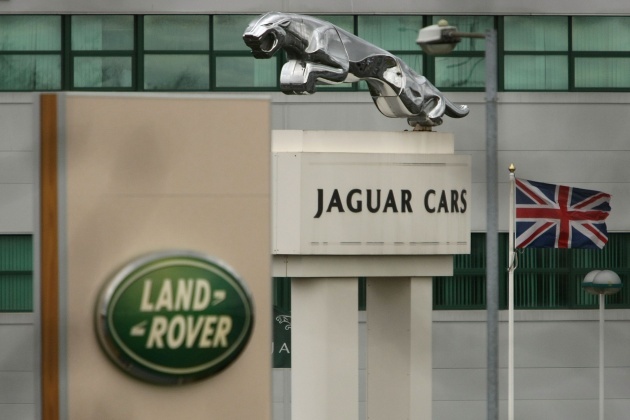 JLR sales rose 23% over the previous quarter. Rule Britannia! Er, India. REPORT: Tata Motors back in the black as Jaguar/Land Rover fortunes improve originally appeared on Autoblog on Mon, 30 Nov 2009 19:00:00 EST. Please see our terms for use of feeds. Our sleuthing colleagues over at The Truth About Cars have dissected electric car maker Zap's latest 10-Q filing, and they unearthed the following little tidbit: "The decrease of $1.5 million (in revenue) is primarily due to the phase out of our three wheeled Xebra vehicle with reduced selling prices." 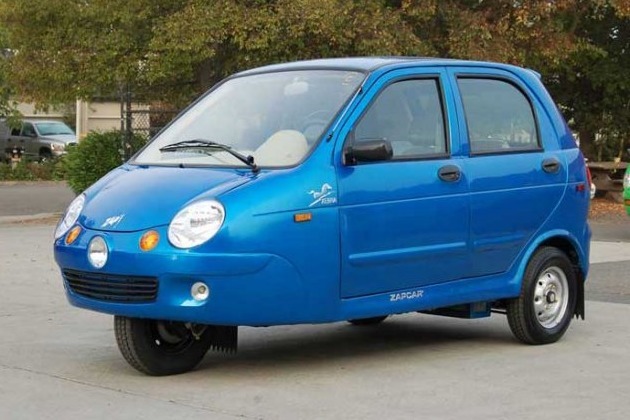 We can't say that we're particularly shocked that Zap has found it difficult to continue moving its little three-wheeled Xebra contraption, especially with discretionary spending money in such short supply these days and reasonably-priced hybrids flooding the used car market. Perhaps even more damning for Zap, though, is the admission that it is doing "less work on the development of the Alias prototype vehicle." Whatever the future has in store for Zap in 2010 and beyond, one thing is for sure: there will be no shortage of press releases to let us all know what's (supposedly) going on behind closed doors. Not-so-shocking admission: Zap kills Xebra, slows development of Alias originally appeared on Autoblog on Mon, 30 Nov 2009 18:29:00 EST. Please see our terms for use of feeds. After watching from the sidelines for years as arch-rival BMW found success with the Mini brand, Audi is finally gearing up to jump into the scrum with the new A1. But unlike the Mini One (which slots below the Cooper in overseas markets), Audi doesn't intend to target the budget market. Instead, the new A1 will take aim directly at the Mini Cooper. Don't expect to see any engine badges on the back of the four-ringed Polo, however, as Audi reportedly intends on keeping the displacement on the A1 hidden. An S1 is tipped to be in the works, but short of that the only thing onlookers will have to distinguish one engine model from another is the exhaust note. Expect the pre-production A1 - previewed by the Metroproject and A1 Sportback concepts - to debut at the upcoming Geneva Motor Show with sales beginning later next year. 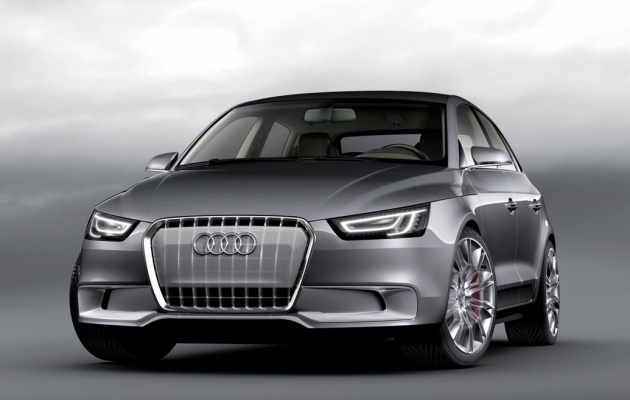 REPORT: Audi intent on keeping upcoming A1 premium originally appeared on Autoblog on Mon, 30 Nov 2009 17:59:00 EST. Please see our terms for use of feeds. The Fiesta Movement, Ford's campaign to introduce the little global Fiesta car to the U.S. market, kicked off at the Chicago Auto Show earlier this year and will end this week during the LA Auto Show with, what else, a party. Oh, and the official unveiling of the 2011 North American version. 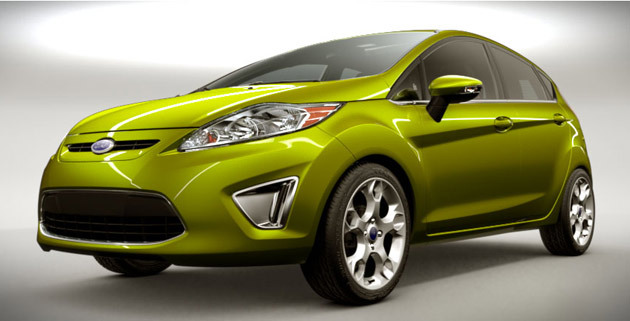 We got a sneak peek of the Fiesta earlier today that it now seems was incorrect, based on these new pictures found buried on Ford's website. The U.S.-style three-bar grille is thankfully not present in these official pics, though the hatch and sedan do wear different grilles (we like the hatch's version better, for what it's worth). The rest of the car remains as good-looking as the Euro-spec version ever did, and the interior will be a big draw for this car - along with solid MPG numbers, of course. For those of you who hoped Ford would bring the Fiesta over from Europe pretty much intact, it appears your wishes have been granted. We'll have all the details from LA right soon. 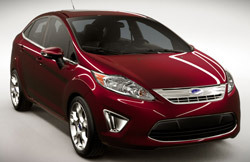 2011 Ford Fiesta gets another early reveal originally appeared on Autoblog on Mon, 30 Nov 2009 17:30:00 EST. Please see our terms for use of feeds. Reports of Toyota F1's demise may prove to have been exaggerated as the latest rumors from the racing world suggest that the Japanese automaker is in discussions with a Serbian outfit about taking over the Cologne-based racing team. Stefan Grand Prix is backed by Serbian engineering firm AMCO and headed by one Zoran Stefanovic, who, like N.Technology, filed an official complaint over the FIA's selection process for new teams. His suit was rejected, but Stefanovic remained determined. The departure of Toyota from the scene and the availability of its assets - including its 2010 car design and the all-important entry slot for next year's championship - may prove to be his way in. The deal could involve Toyota sticking around to supply engines for the next few years, and Kamui Kobayashi could be part of the package, operating from the current facility in Cologne, Germany, until the move to Serbia could be completed. For its part, Toyota is likely trying to find a way to get around its commitments under the Concorde Agreement to remain in the series, the failure of which to honor could cost Toyota hundreds of millions in fines. Meanwhile if Stefan Grand Prix manages to pull it off, they'll have successfully circumnavigated the allegedly flawed selection process and secured their spot on the grid. Stefanovic denies the prospect of his outfit simply stepping in to Toyota's place, but confirmed that negotiations are under way. Meanwhile Sauber - which just reacquired itself from BMW in the wake of the failed Qadbak deal - was hoping Toyota would default on its agreement, thereby giving them the green light. If the Stefan deal goes through, Sauber could be locked out, unless the powers-that-be opt to let them in as an unprecedented 14th entry. 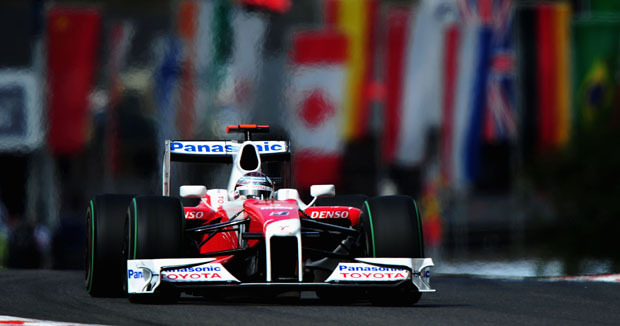 Serbian team reportedly in talks to take over Toyota F1 originally appeared on Autoblog on Mon, 30 Nov 2009 17:00:00 EST. Please see our terms for use of feeds. Once again, Tata chairman Ratan Tata has confirmed via the South Korean Maeil Business Newspaper that his company intends to launch a hybrid version of the Nano. While it's impossible to know for sure, we'd imagine that starting off with the World's Least Expensive Automobile may very well equal the World's Least Expensive Hybrid. We're also unsure what kind of hybrid system Tata is developing - we wouldn't expect to see a full hybrid system with an electric motor and battery pack large enough to power the vehicle for long periods of time, but we'd still hope for something more substantial than a simple stop/start micro system. Previous reports indicate that a diesel engine is also in the works for the Nano, and we have high hopes that the inexpensive machine will make its way in somewhat modified form to the United States. Even with its current drivetrain, the gas-powered Nano delivers well over 50 U.S. miles per gallon, which would surely make for a welcome option here in America. 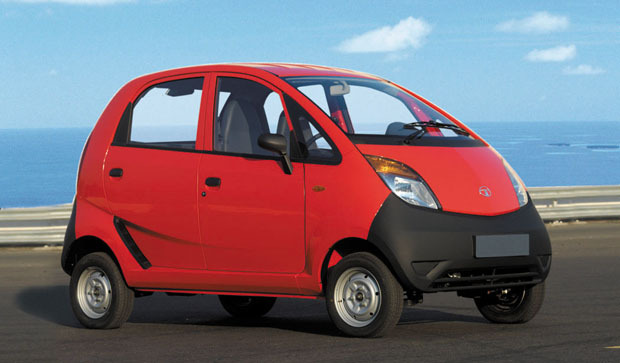 REPORT: Ratan Tata again confirms hybrid Tata Nano originally appeared on Autoblog on Mon, 30 Nov 2009 16:30:00 EST. Please see our terms for use of feeds.